NBEV soared on a deal with Walmart, where details related to the deal such as timing and number of stores were scant. Koios, a CBD-infused beverage company, announced a deal to get into over 1,000 stores in Walmart six weeks ago with a launch date of April 1. Koios has a $28 million market cap and has lost most of its gains made since its own Walmart announcement. NBEV's deal with Walmart looks far overhyped and unsustainable. Isodiol, another company in the CBD space, has a revenue multiple of 2x, compared to NBEV's 10x revenue multiple. NBEV announced a $200 million prospectus last Friday; investors can expect further significant dilution. My love-hate relationship with New Age Beverages Corporation (NBEV) continues after the company's stock price rose 39% on Monday after announcing an expanded deal with Walmart. This increase came even as NBEV filed a prospectus last Friday evening to sell up to $200 million worth of securities in the form of common stock, preferred stock or warrants. My initial reaction was to buy the stock on this news, but I changed my mind later in the day and took profits after more analysis on the deal and prospectus. I eventually decided to open a bearish position through put options as I have determined that NBEV's dilution is outpacing its accomplishments and there are far cheaper peers in the CBD and alternative beverage space for investors who actually want to buy on value and not on hype. My previous article on NBEV called "New Age Beverages Is Not A Cannabis Play Yet But Is Up On Hype A Month After A $1.28 Financing" was published last September when the stock was rocketing up between $5 to $10 depending on what time of day you were looking at it. Since then NBEV has slowly cooled off until it was less than $5 again just before the offering and Walmart announcement. Prior to this transaction, ABRW had 12.6 million shares outstanding. 16 million shares at $0.40 leads to a $6.4 million market cap for annual revenue of around $5 million - $1 to $1.5 million for the beer business and $3.5 to $4 million for the kombucha business - assuming the company's claim of the revenue stream acquired is accurate going forward. The price to sales ratio drops to around 1.3x, far below the ratio of larger brewers of around 4x, although it remains to be seen exactly when the company can turn a profit. REED is a good proxy to measure the mid-term upside in ABRW. ABRW's net losses are largely due to lack of scale as gross margins are well over 50%. After several years of operating losses, REED pulled in a small operating profit for 2014 and is expected to earn a $0.09 EPS on $53 million in revenue for 2015. If ABRW can reach $40-$50 million in annual revenues over the next five years it should also be profitable and be trading at a market cap of around $70 million just like REED, more than 10x the upside in the market cap. The impressive revenue growth has been offset by the exploding share count from 12.6 million shares four years ago to 75 million today, a result of funding acquisitions and working capital needs. Investors can expect the extensive dilution to continue given the $200 million prospectus filing, though with $43 million in cash on the balance sheet as of December 31, 2018, it doesn't appear that NBEV is in desperate need of cash at this very moment. NBEV has over $50 million in contingent and off-balance sheet obligations in 2019 so perhaps the company is merely preparing itself for these payouts. The financial media went wild to report NBEV's deal with Walmart, the first national retail distribution agreement NBEV has signed with the retailer. The lift in the stock price may have as much to do with hype as with anything else as one outlet erroneously reported that the drinks will be CBD-infused while another assumed that this is the first step of an ongoing relationship between Walmart and NBEV, including CBD-infused beverages. While this could be the start of a lucrative relationship for NBEV, the $140 million increase in market cap seen on Monday is ludicrous when considering the lack of details surrounding the deal and another deal recently signed by a company in the same space. VANCOUVER, Feb. 27, 2019 /CNW/ - Koios Beverage Corp. (CSE: KBEV; OTC: KBEVF) (the "Company" or "Koios"), is pleased to announce it has signed a vendor agreement with Walmart Inc., the world's largest retailer. Walmart Inc. (NYSE: WMT) ("Walmart") is a multinational retail giant that operates a chain of hypermarkets, discount department stores, and grocery stores across the globe. Now, Walmart will soon be adding the Koios beverage line to its new functional beverage set. Initially, Koios products will be available in 1,094 Walmart locations across the United States. The retail giant will carry Pear Guava, Blood Orange and Peach Mango beverages. The products will also be available through Walmart's online portal at www.walmart.com and will be available in stores April 1st of 2019. So how much has the Walmart deal been worth to Koios? It looks like about $10 million in market cap. NBEV longs banking on hype to continue in the face of this barely month-old example should not get their hopes up. In my previous article, I mentioned Isodiol International Inc. (OTCQB:ISOLF) (ISOL.CN) as a cheaper alternative to NBEV in the CBD infused beverage space. Isodiol has since gone through restructuring of its business but still has a focus on hemp-based CBD infused consumer products and managed to generate $7.1 million CAD in revenue for its fiscal Q3 ended December 2018, a growth rate of 21% from December 2017 despite all of the company's recent issues. Isodiol achieved over $24 million in revenue during the first nine months of its fiscal year, so it trading at around a 2x revenue multiple. Whatever hype is surrounding NBEV, Isodiol is at the polar opposite end of that so investors could consider its 2x revenue multiple at the lowest end of the CBD range and may consider that company as a far superior value investment versus NBEV. I have nothing against New Age Beverages as a young company trying to develop its business. It's actually doing a lot of things correctly when it comes to aggressively pushing its brands in a very cut-throat retail beverage space. The issue is that this business plan comes at a cost of major dilution and the valuation for the company of 10x revenue is absurd. I have given two examples of "non-hyped" companies in the CBD beverage space in Koios and Isodiol that are clearly cheaper alternatives. 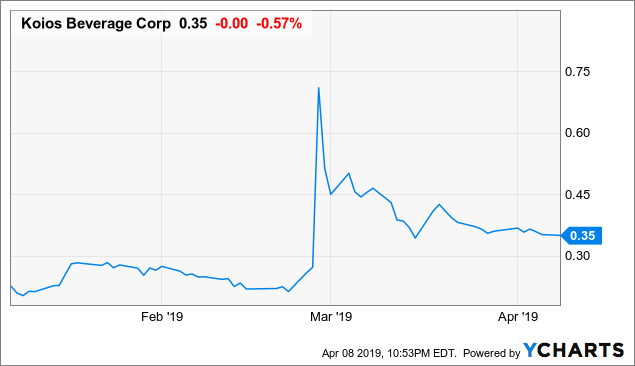 Once the hype of the Walmart deal subsides, watch for NBEV to drift back down like it did before as more and more shares are absorbed into the float and investors realize that an unprofitable beverage company does not deserve a 10x revenue multiple. Disclosure: I am/we are short NBEV. I wrote this article myself, and it expresses my own opinions. I am not receiving compensation for it (other than from Seeking Alpha). I have no business relationship with any company whose stock is mentioned in this article.